I've been a fan of Seanan McGuire for a few years now (which in terms of McGuire’s book production equals about 300,000 books and short stories published (the absolutely amazing thing is that this is not nearly the staggering hyperbole that it appears to be when compared to reality). That's why I was utterly shocked that the Magic For Nothing begins in the final moments of the previous book in the series Chaos Choreography, except from Antimony's point of view. For those that have not read Chaos Choreography, please be aware that the following section will contain spoilers. Not only does Magic For Nothing take up in the final moments of Chaos Choreography, but because of Verity’s shocking declaration of war against the Covenant, Magic For Nothing’s entire premise is based on the effects of Verity’s actions. This includes forcing Antimony’s primary action in her attempts to infiltrate the Covenant, as well as her family’s resentment towards Verity for her selfish actions in dancing on TV and declaring war on the Covenant. This is the first time that we’ve seen such a divide/resentment in the actions of the different Price family members, and as a reader of the series it is absolutely fascinating. Not only that, but these actions bring up many feelings of resentment that have been there under the surface, making the emotional turmoil much more realistic for a close-knit family who all are forced into the family business in one way or another. 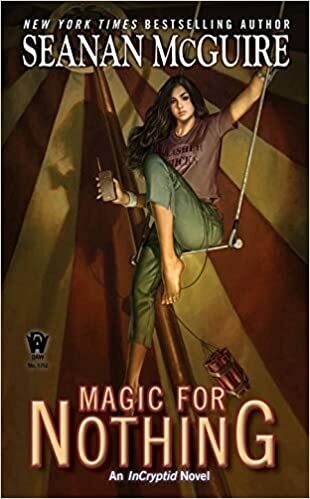 As for the book itself, other than a surprising lack of explosives (this being Antimony’s book and all), Magic For Nothing was positively ripe with action and intense sequences as Antimony infiltrates not one but two different organizations (the Covenant and the Carnival). Of course, McGuire also does a fantastic job, using the Carnival and Antimony’s surprising connection to her long-lost cousin to more fully explore Antimony’s feelings of resentment, duty, and loneliness in relation to her family and their dynamic. This is absolutely fascinating, as Verity mostly thought of herself and her dancing, trying to get out of the family business, Alex mostly cared about his research, with an almost accidental romance on the side, yet it is Antimony, the youngest and most disconnected to the family, having been teamed up against by her siblings while growing up, who seems to be the most loyal to a family and who takes on the greatest risks. These emotional and physical ramifications propel the series forward in a way that has me positively shaking in my boots with excited energy for more. All in all, I was a big fan of Magic For Nothing. It had action, great character development, insight into other characters in the series, and even ended with one heck of a cliff hanger that will leave readers (or at the very least THIS reader) positively begging for the next book in the series.